The island peak got its name by a climbing team of Eric Shipton as it was found like an island set adrift in a sea when viewed from Dingboche at a distance. Located at a height of 6189m in the Khumbu region in the Eastern Nepal between the chains of Ama Dablam and Lhotse Mountains and on the top of Chhukung Glacier, the Island peak got first defeated in 1956 by a Swiss team as a preparation for climbing Mt. Everest and Lhotse. Although The peak was later renamed as “Imje Tse” in 1983, it could not beat its first name “Island Peak”. Island Peak is one of the most popular climbing peak in Nepal. Island Peak climbing has been designed for the amateur adventure seekers having no climbing skills such that they can easily climb the Himalayan Summit of 6,189m. One of the most important highlight of Island Peak Climbing is that climbers gain an unforgettable and magnificent close up view of various mountains such as Lhotse, Nuptse, Makalu including Mt. Everest, Ama Dablam and Cho-O-Yu. 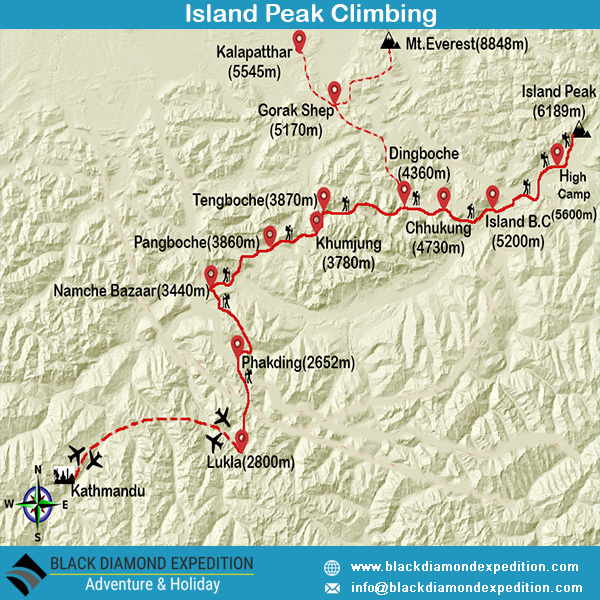 Island Peak climbing route offers breathtaking views of beautiful landscapes, pristine cultures and rare flora and fauna. The itinerary designed professionally by Black Diamond Expedition offers ample time for the climbers to acclimatize even for the beginning climbers. The exciting climbing journey to Island peak starts with a magnificent Himalayan flight to Lukla from Kathmandu. The real trek starts from Lukla all the way through Sagarmatha National Park passing by many beautiful settlements and amazing view of landscapes. the scenic Himalayas, different flora and fauna including unique cultures are some added advantage of Island peak climbing. This trek passing all these beautiful scenery en route we finally reach the bare land of the base camp of Island peak and then to the high camp. The exhilarating climbing leads us to the summit of Island peak in a few hours and then we return to Chhukung village the same day. Finally, our amazing trip concludes when we fly back from Lukla to Kathmandu. Upon arrival in the Kathmandu airport (TIA), you will be greeted by a representative from Black Diamond at the arrival gate. You will be then transferred to the hotel. After the check in, you can either take rest; hang around in the city as it all depends upon your interests. In the evening, we will organize a Welcome Dinner at an excellent traditional Nepalese restaurant where you will enjoy a Nepalese cultural program as well as a fine meal. Today after breakfast we will start a guided tour to several of the most historical and spiritual attractions in Kathmandu. Some of these landmarks are considered World Heritage Sites; including the historic Durbar Square, the famous 'Monkey Temple' or Swayambunath, the sacred Hindu temple of Pashupatinath and Buddhists shrine of Bouddhanath which is one of the largest Stupas in the world. In the afternoon, there will be a pre-trip discussion where we can meet our trek leader and other team members. Black Diamond briefs us regarding the trip as well as provides us an opportunity to ask any questions we may have regarding our upcoming adventure. After breakfast, we get transferred to the domestic terminal of Kathmandu airport for an early morning flight to Lukla (2,800m/9,186ft), a gateway destination from where our trek begins. After an adventurous 40 minute flight above the breathtaking green and white mountains, we reach the Tenzing-Hillary Airport at Lukla. This is one of the most beautiful air routes in the world culminating in a dramatic landing on a hillside surrounded by high mountains peaks. Here we meet our other crew members and after some packing and arrangements, we start our trek through the prosperous village of Lukla until we reach Phakding. To assist in acclimatization, we only have a short hike today. However, if interested in additional activities we can take a side trip to a nearby monastery. Walking through a beautiful pine forest, the track leads us along the Dudh Koshi River through many suspension bridges, one of which is the famous Hillary Suspension Bridge. First, we catch wonderful prospect of the glistening Mt. Thamserku (6618 m). Through the settlement of Benkar, Chumoa, Monjo, we come to the check post and entrance to Sagarmatha National Park. We pass through the last village of Jorsale before reaching Namche Bazaar. The trail climbs through the forests and bridges until we reach the confluence of the Dudh Koshi and Bhote Koshi rivers. After a final steep ascent of about two hours we get first sight of Mt. Everest peering over the Lhotse-Nuptse ridge. We stop at Chautara to admire the view. We still need to hike about 1.5 hours to reach Namche Bazaar, a gateway to Mt. Everest and main trading center of this region. Today is our mandatory acclimatization day. It is recommended to stay active instead of being idle. If we walk few hundred feet vertical, it will help to proper acclimatize. We will visit Tourist Visitor Center near the headquarter of the Sagarmatha National Park where we can observe an assortment of things related to the first Everest ascenders, Sherpa culture and learn about the various plant and animal life of the Everest region. We also take an interesting side trip up to Khumjung. We climb up to the famous airstrip at Syangboche. We also visit Hillary School which is at the same site. After having lunch, we walk back to Namche Bazaar. After breakfast, we start our trek towards Pangboche enjoying the superb view of Mt. Everest, Nuptse, Lhotse, Ama Dablam and close up view of Thamserku. Our trek follows the gradual trail with few ups and downs overlooking the magnificent view of the great Himalaya. Along the way, we can spot wild lives like pheasant, musk deer, or a herd of Himalayan Thar. The trail goes gradually down up to Kayangjuma. The path eventually reaches Sansa which is the major trail junction to Gokyo valley and Everest Base Camp. The track then follows through the pine forests and after we cross the prayer flags festooned bridge over Dudh Koshi River, we reach Phunki Thenga, a small settlement with a couple of teahouses and a small army post amidst the alpine woods. After having a relaxed lunch at Phunki Thenga, we then have a little tough climb steep up through the pine forests while before we reach Tengboche. Tengboche is a great place for close up views of Ama-Dablam, Nuptse, and Everest and it has a biggest Buddhist Monastery all over in Khumbu region. Shaded by rhododendron trees, the path leads gradually down to the river once again to another airy suspension bridge. An hour's walking from here brings us to Pangboche. We start our trek after the morning breakfast. Pass through several Chortens and Mani walls and small villages. Enjoy lunch with fantastic close-up views of Ama-Dablam. In the afternoon, go north to Pheriche or take the eastward trail beneath the towering north face of Ama Dablam. From here onwards the walk is fairly moderate as we enter the Imja Valley. The valley ahead will begin to open up as we approach the confluence of the Lobuche River, we descend into the river and begin the last and steepest climb of the day up to Dingboche. On arrival in Dingboche, we enjoy the beautiful array of fields enclosed by stone walls to protect the barley, buckwheat and potatoes from the cold winds and grazing animals. Today is our second acclimatization day. It is recommended to stay active and moving during the rest day too instead of being idle which allows the body to adjust thin air more quickly and lessen the probable effects of altitude. We hike up to the ridge around and enjoy the wonderful scenery of Island Peak seen as an island in a sea of ice; and different mountains peaks with valleys. Today the walk is pleasant. We leave Dingboche passing through a kilometer long stone walled fields and rocky trail in alpine landscape. The magnificent view of Mt. Lhotse on left and Mt. Ama Dablam on right will add essence in our leisure walk. After around three hours walk we reach at Bibre. From there we walk for about half an hour to Chhukung enjoying the view of soaring Island Peak (Imja Tse) 6,189m. There are glaciers and massive snowy mountains all around. After breakfast we follow the steep path towards south and then take east turn leads us towards main valley. We continue walk through huge rock and cross Imja and Lhotse Glacier to reach the wide valley where we set our camp. Overnight at Island Peak Base Camp. Today is very short walk. After breakfast we climb up beyond base camp. The trail becomes narrow and rocky as we climb steep hillside. We fix the tent nearby rock channel. After lunch we re-manage our climbing gears and personal equipments for tomorrow. If required our guides will give last minute training on climbing techniques, using climbing gears, fixing harness, etc. Today is our summit day. We wake up around 1-2 AM since we have to conquer summit before noon. Later it may be difficult because of high speed wind. After breakfast we begin our expedition climbing the rock channel. There are several short rock steps before we reach the ridgeline. And after then the route leads to bare and thrilling summit glacier. From there we need to rope up for the glacier as it may contain several small gaps. Our guide will fix up the ropes up to the summit. With the support of fixed rope we climb steep snow slop to reach on the summit. After enjoying the view from summit and taking photographs we descend all the way down to Chhukung. After breakfast the lodge, follow the valley towards Pangboche and short climb to Tengboche through the forest of Rhododendron and pine. After that the trail drops steep down to the valley to cross the suspension bridge and continue up to Khumjung for overnight. After short climb to the ridge the trail drops down through the ridge from where we can see the Namche as U angle settlement. Evening explore around the town and overnight at the lodge. After breakfast at the lodge, the trail drops downhill through the pine forest till to the bridge and continue walk to the Monju. Again some formalities have to be done at the check post of the National park at Monju then continue walk to the Phakding for the lunch. After that our last day of the trek continue to the Lukla. Stay overnight at the lodge. Normally flights are always in the morning due to the weather. The early morning flight drops us at Kathmandu. You can rest and relax throughout the day in your hotel. If get interested to take some gifts home from Nepal for friends and relatives, visit to some nearby shops or venture out in Thamel for typical Nepalese goods which can be assisted by our guides or you can do it yourself too. If you want to explore any other areas of Kathmandu take the time to do that today. Late evening we will celebrate dinner together for successfully completing Island Peak Climbing. After breakfast you are free till departure time. Approximately 3 hours before your scheduled flight a representative from Black Diamond will take you to the airport. 3 nights accommodation in Kathmandu with breakfast (Hotel Encounter Nepal- www.encounternepal.com or Hotel Norbu Linka- www.hotelnorbulinka.com) or similar 3-star hotel as per availability. Experienced trekking and climbing guide/leader, cook, assistant climbing guide (1 assistant guide for 4climbers), porters (1 porter for 2 two climbers) and other necessary helpers as per requirement including their salary, insurance, equipments, transportation, food and lodging.